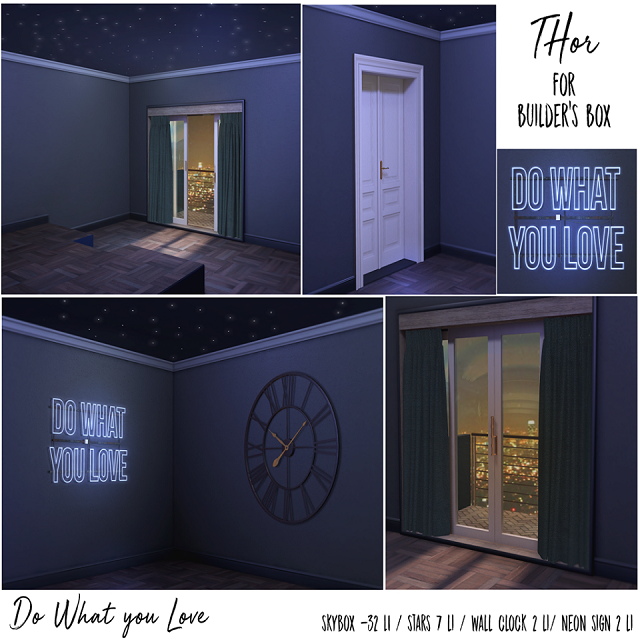 THOR has released the Do What You Love Skybox for the current round of BUILDER’S BOX! Create the perfect environment for romance with this gorgeous build and decor set from Thor. The Do What You Love Skybox (32 Li) is a single room build featuring an elevated platform with access steps for the bed of your choosing, as well as balcony access with a view of the city. Versatile decor elements include; Stars (7 Li), Neon sign (2 Li), and Big Wall Clock (2 Li). Pair the provided decor with your own for a wholly seductive living space! Permissions for Skybox are Copy only. Permissions for decor are Copy & Modify. If you haven’t already purchased your Builder’s Box, no problem! The After Hours Box (and previously released boxes) are still available for purchase at full price. Simply visit the BUILDER’S BOX Headquarters or check out their store on Marketplace.